Because we all love garlic and we all eat chicken, I always have these in my kitchen. Always. While there are sooooo many ways to cook this staple meat at home, I always end up serving the most simple ones to prepare. Siyempre, nandiyan lagi ang pambansang manok - Magnolia Chicken, whole dressed chicken or in choice cuts for specific dishes I plan to cook. 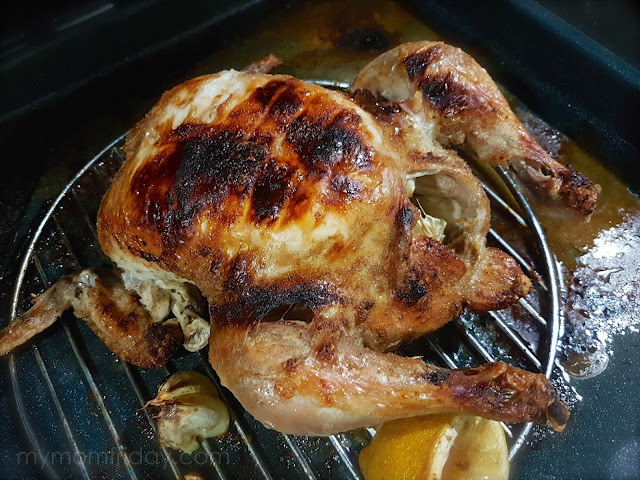 I used to make rosemary-garlic roast chicken, but hindi type ng family ko pag may fragrant herbs. Then I tried with some Chinese spice rub and it didn't get a thumbs up either. This one is very good daw. =) I hit the jackpot! The original recipe shared by Bettina only calls for 4 ingredients. It's a perfect foundation for a good roast chicken, guaranteed. I tweaked it and made my own version -- still very simple and definitely tasty. I did not even marinate the chicken with anything. 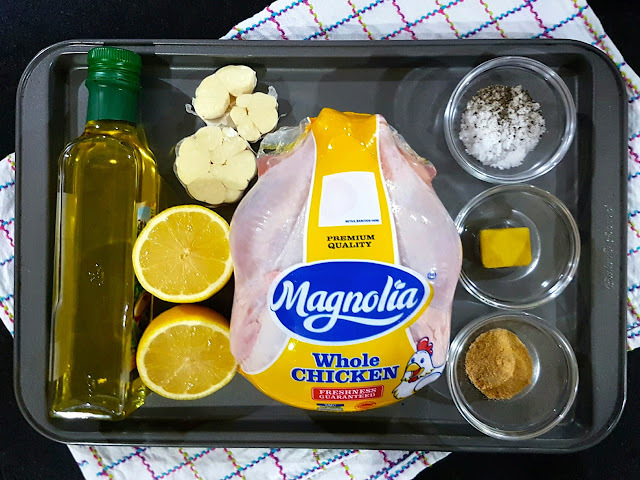 Without further ado, here's a delicious Magnolia Chicken dish that you can easily prepare by adding only 7 basic ingredients to season the whole chicken. Nothing fancy here. Let's get started. You will need a turbo broiler or oven to cook this. I used an oven. 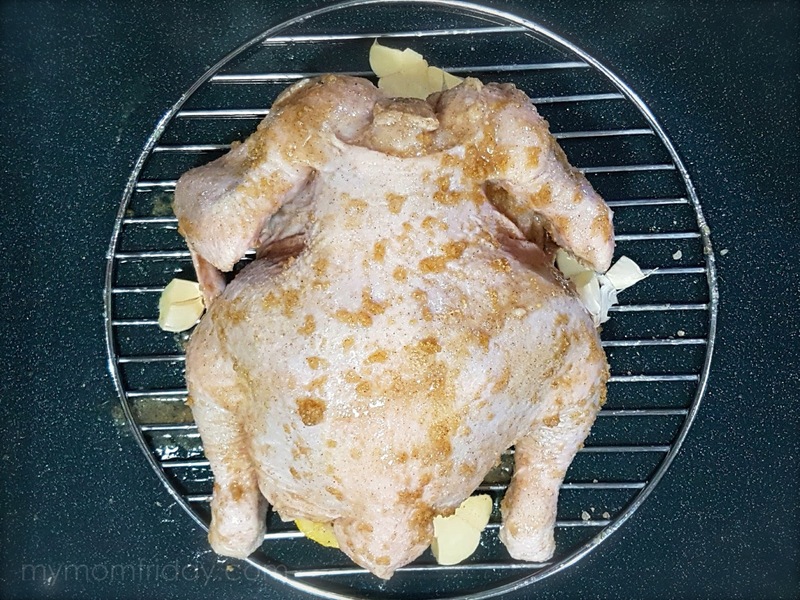 Pre-heat oven to 220 degrees C / 430 degrees F.
Lower temperature to 200 degrees C and place chicken in the middle rack. Roast for 45-60 minutes, depending on the oven and size of chicken. 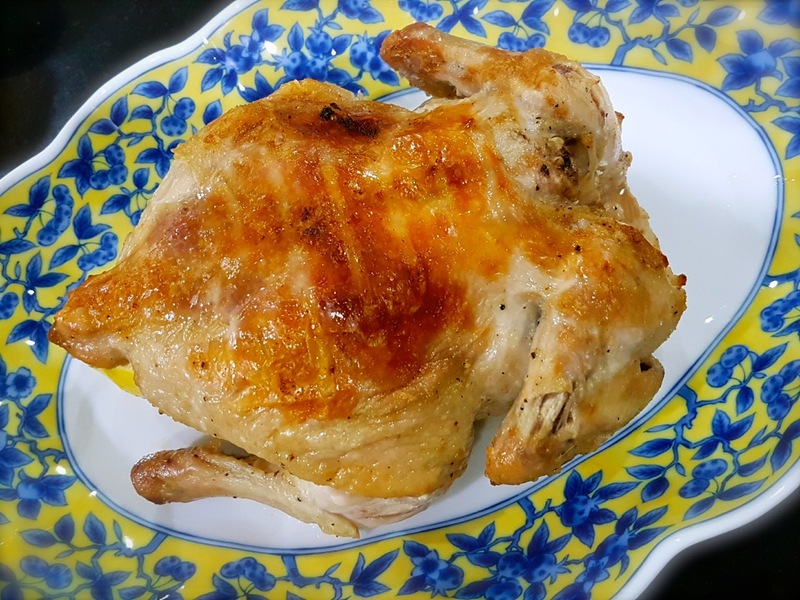 Turn over the chicken after 30 minutes and increase temperature back to 220 degrees. Remove from oven and serve whole, or let it cool for a few minutes before chopping it up. Save the drippings and take out the roasted garlic from the cavity -- transfer to a sauce pan to make the gravy. Add about 3 tablespoons of water and 1 tablespoon flour in the sauce. Mix well and simmer for about 2 minutes or until it thickens. Gravy can be salty so add water and adjust to your taste. Serve gravy on the side or pour over roast chicken. 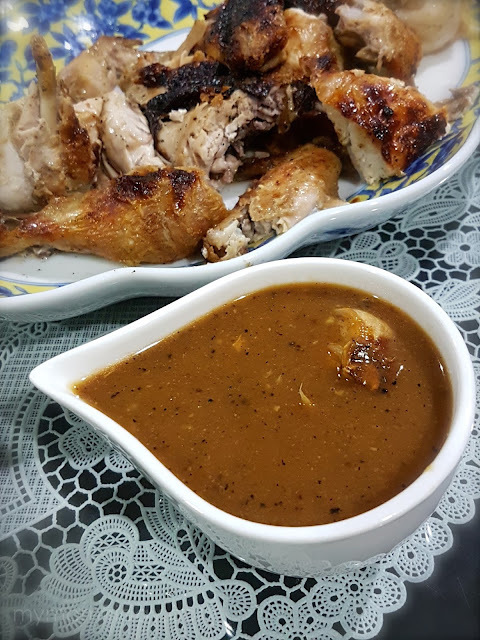 Chopped and served with the flavorful gravy. The roast chicken was fall-off-the-bone-tender, juicy, and flavorful. Don't scrimp on the lemon and garlic. The browning will differ kasi iba-iba ang settings ng oven. I think cooking will be more even in a turbo broiler. But taste-wise, panalo ito. Promise! I'm pleased to share that Magnolia Chicken is packed fresh, with no hormones, no steroids, no antibiotic residue. Good to know, right? Watch our very own beauty queens here and learn kung bakit bet nila ang Magnolia Chicken. I also buy the Magnolia Free Range Chicken whenever it's available. With this basic fool-proof recipe, you now have the option to add dry herbs and spices to your rub, like rosemary, thyme, paprika, basil... anything you like to build your own mix of seasonings to flavor your dish. 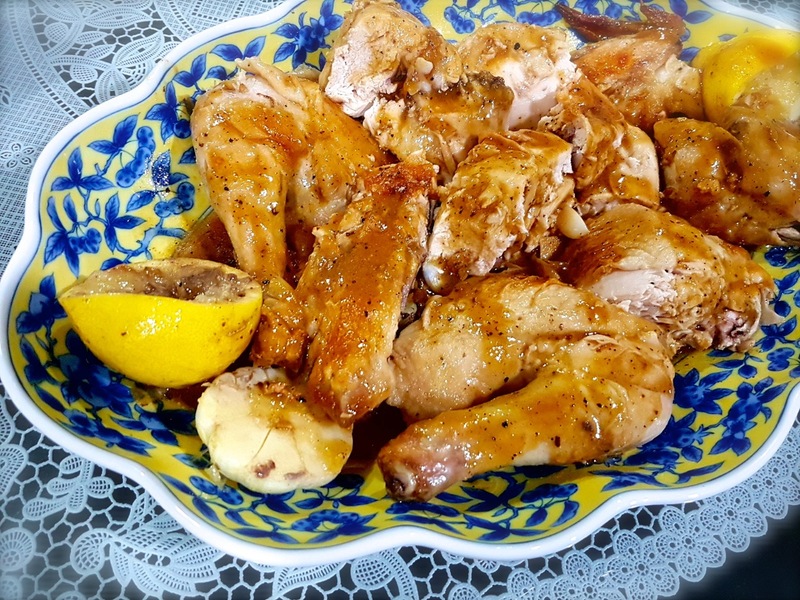 My Garlic-Lemon Roast Chicken is family-approved too, so I am one happy cooking mama! Try it and let me know how it goes.